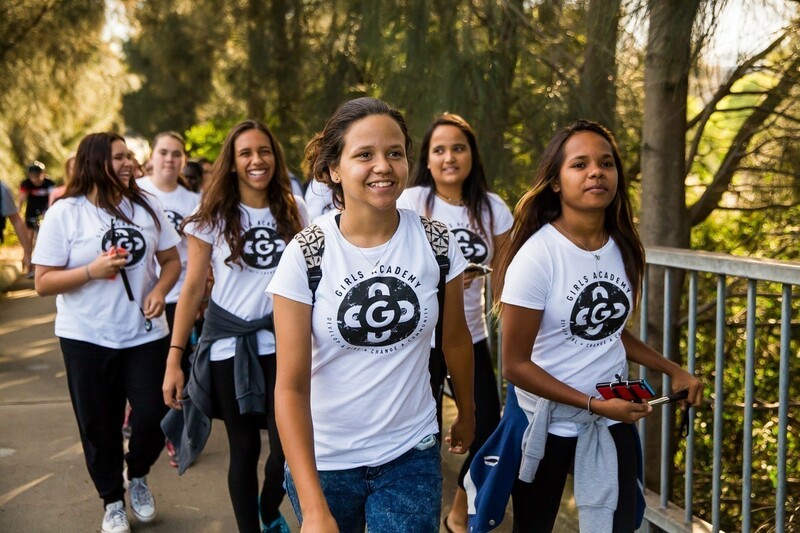 The Girls Academy Program works within the school system to drive community-led solutions aimed at reducing the barriers that prevent Indigenous girls from completing their education and reaching their full potential. Australian Indigenous girls face some of the greatest social disadvantage of our nations population. In every social measure, Australian Indigenous Girls trail their non-Indigenous peers in health, education, employment opportunities, earning capacity and life span. As the future mothers and leaders of the Indigenous community, strong and educated young women are critical to closing the unacceptable gap that exists between Aboriginal and non-Aboriginal Australians. RMLA Academy girls have the potential to be powerful catalysts for change in their communities, and we believe that education is the key tool required to bring about this change. Indigenous women as role models and mentors. Our team of Program Managers (80% of which are Indigenous women) inspire and encourage students through one-on-mentoring, guidance and “big sister” or “auntie” style support. Extracurricular activities including health & well-being workshops, sporting competitions/carnivals, University discovery trips and much more. Post-school transition planning to support students to develop career, education, training and employment pathways. Leadership, Teamwork and Vision activities designed to support the development of student’s confidence, attitude, leadership and teamwork skills. Community Advisory Panels have been established in 20 communities. These Panels provide local, grass-roots advice and help steer the activities of RMLA. Academy Rooms at each school provide a sanctuary for the girls to connect with each other, to learn and prosper in a safe and nurturing environment. • future generations of Australians, both Indigenous and non-Indigenous. By improving educational outcomes, our girls have more and better employment opportunities, which in turn supports strong, healthy communities that grow strong healthy and happy families. This ultimately results in intergenerational change and a closing of the gap between ATSI and non-ATSI measures of well-being. Conversely, poor school attendance results in disruption to education which often leads to failure to achieve core skills such as literacy and numeracy. There is a strong correlation between this and truancy, crime and risky behaviour leading to persistent Indigenous disadvantage, a welfare existence and widening of the gap between Indigenous and non-Indigenous measures of well-being. The linkage between The Girls Academy, improved educational outcomes and a better quality of life is very strong. We have recently expanded into Queensland for the first time with seven new Academies in the Wide Bay region. We have also been granted funding to expand provision to another 500 Indigenous girls in this state by December 2018. Currently a number of schools and communities in QLD have been in discussion with RMLA to establish a Girls Academy at their school and this expansion is now underway. We will confirm new locations as they are established. SPONSOR: Talk to us about the many options to sponsor the Academy through supporting events, equipment purchase, training and development, travel and so on. We can tailor a Sponsorship program just for you. PARTNER: We foster collaborative and strategic partnerships that create lasting change, which benefits all stakeholders. Contact us to discuss. CHAMPION: You can become a strong campaigner and advocate for the girls by telling others about us. Join and share our mailing list, Facebook page, Twitter and LinkedIn accounts and become part of the conversation. ONLINE SHOPPING: Host the Girls Academy on your organisations online store to promote charitable donations to the partner customer base. POINT OF SALE TRANSACTIONS: Feature the Girls Academy as a donation recipient at your store and customers can elect to donate a small amount at the point of sale.